Encore at Briar Chapel is a 55+ community in Chapel Hill, North Carolina. This active adult neighborhood is located within the established master-planned community of Briar Chapel. Top-notch builder David Weekley Homes will offer innovative single-family floor plans that feature unique designs, premium finishes and fixtures, open layouts, outdoor living areas, and plenty of options for customization. In addition to offering elegant home designs, the builder will also provide impressive amenities exclusively for residents of the active adult subdivision. Situated within the Raleigh-Durham area, residents are never too far from major roadways, entertainment, attractions, and daily conveniences. From museums and botanical gardens to performance venues and upscale restaurants, active adults will find everything they are looking for in this premier location. Encore at Briar Chapel offers private, resort-style amenities for its residents to enjoy. The 3,100 square-foot clubhouse is the central hub of physical activity and social recreation, equipped with a full-time lifestyle director. 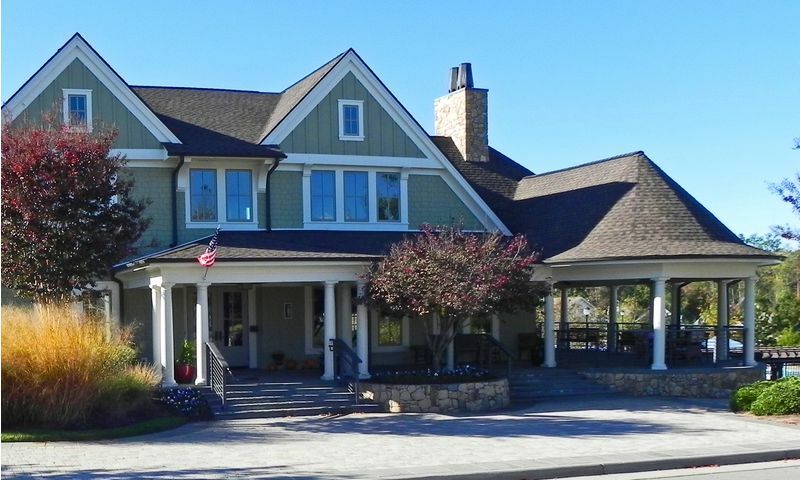 The clubhouse houses a catering kitchen and a full entertaining kitchen. Fitness equipment room, fitness classroom and additional club room all surround the open entertaining area. The outdoor area sports a covered patio complete with large TV. The amenities continue outdoors with a sparkling swimming pool and patio, perfect for enjoying on a sunny day. Tennis, pickleball and basketball courts will be available for neighbors to challenge each other in friendly competition. Residents can also bring along their furry friends and spend some time outdoors at the dog park. The community is surrounded by 24 miles of walking and biking trails as well as parks and natural space that make it easy to get some fresh air and scenic nature views. As an added bonus, active adults will gain access to all of the amenities within the master-planned community of Briar Chapel. World-class amenities include The Briar Club, which has a social room that is perfect for mingling with friends and family. Other amenities include a fitness center, aerobics and dance studio, community room, card room, catering kitchen, and bar. Residents will also love the 900 acres of green spaces and 24 miles of walking and biking trails that meander throughout the development. Additional tennis, pickleball, and basketball courts and a playground are also on site in this vibrant community. Additional tennis, pickleball, and basketball courts are also on site in this vibrant community. Premier builder David Weekley Homes began construction of this 55+ community in 2016 and will offer 185 single-family homes upon completion. With ten distinct floor plans ranging in size from 1,591 to 3,127 square feet and situated on 45-foot or 55-foot homesites, homebuyers have great options to choose from to fit their style and budget. These homes offer two to four bedrooms, two to four-and-a-half bathrooms, and an attached two car garage. These thoughtfully designed homes feature open and bright layouts as well as expanded outdoor living areas. Front yard maintenance is also included in all of the homes within Encore at Briar Chapel. This age-restricted neighborhood offers a variety of clubs and activities that will keep residents active and entertained all year long. An onsite, full-time lifestyle director will be available to help plan and organize special interest groups, day trips, classes, and events for all to enjoy. Some of the activities will include walking group, water aerobics, boot camp, yoga, Zumba, tennis, and pickleball. Homeowners will love the welcoming and vibrant atmosphere within the community and be able to build lifelong friendships with other like-minded adults. As Encore at Briar Chapel continues to grow with more residents, more diverse activities and events will be added to the social calendar. Being located in Chapel Hill, NC, allows homeowners to be close to everything they could want or need, yet still live within a serene and natural setting. The community is near Highways 501 and 64 as well as Interstate 40 that makes getting around town easy. Shopping centers full of retail and grocery stores as well as a CVS Pharmacy are just a few minutes away and include Chatham Crossing, Harris Teeter, Polks Village, and Cole Park Plaza. Also, located at the front entrance of the Briar Chapel Community is The Veranda which includes eateries, drug store, hair salon, eye doctor and other conveniences. Homeowners can visit the campus of the University of North Carolina at Chapel Hill or view artwork at the Ackland Art Museum, which are 20 minutes away. The North Carolina Botanical Garden is also close by for a quiet and relaxing day among nature. Golfers will love being within driving distance to The Preserve at Jordan Lake Golf Club and Finley Golf Course. Medical facilities can be found at the UNC Health Care that's 20 minutes away. Downtown Raleigh is about 50 minutes away and offers plenty of big-city entertainment and attractions. The Raleigh-Durham International Airport is also nearby for long-distance travel. Active adults looking for luxury homes and amenities within a prime location should look no further than Encore at Briar Chapel in Central North Carolina. There are plenty of activities available in Encore at Briar Chapel. Here is a sample of some of the clubs, activities and classes offered here. Premier builder David Weekley Homes began construction of this 55+ community in 2016 and plans to offer 185 single-family homes upon completion. With five distinct floor plans in the Tradition Series offers layouts ranging in size from 2,109 to 3,127 square feet. They offer three to four bedrooms, two to four-and-a-half bathrooms, and an attached two car garage. Front yard maintenance is also included in all of the homes. Please Note: Not all floor plans are available at this time. The Classic Series has 5 floor plans ranging in size from 1,591 to 2,244 square feet. Homebuyers have great options to choose from to fit their style and budget. These homes offer two bedrooms with dens, two bathrooms, and an attached two car garage. Please Note: Floor plans not available at this time. 55places.com is not affiliated with the developer(s) or homeowners association of Encore at Briar Chapel. The information you submit is distributed to a 55places.com Partner Agent, who is a licensed real estate agent. The information regarding Encore at Briar Chapel has not been verified or approved by the developer or homeowners association. Please verify all information prior to purchasing. 55places.com is not responsible for any errors regarding the information displayed on this website.